If you have been at ICS a long time, you know that in January things start happening quickly and won’t really stop until June 9. Your Weekly News updates will help you keep track of it all, as will subscribing to our ICS Family Google Calendar, referring to past news updates, and when in doubt, using the magnifying glass “search” function on our website. ICS students go out for recess in the cold (down to 20 degree windchill), and in light rain and snow. Students should always come to school dressed for the weather. When it is under 40 degrees they should always have a winter coat (+ scarf if needed) and hat/gloves. There are many ways to support our Take Flight travelers this winter! Donate to their online campaign and share with friends and family. Tomorrow is Sweet Treat Friday! Purchase a treat for $1 at dismissal on Friday to support this year’s Take Flight travelers. The Take Flight team will have two tables set up: one in the play yard and one on Naudain Street. End your week with something sweet! THANK YOU! To learn more about the Take Flight program, take a look at their blog from past trips! Lion King, Jr. t-shirts are for sale in the online school store now. This year’s shirt was designed by Yarizbeth Lorenzo in M. Doris’s graphic design elective! We couldn’t be prouder of her work. Musical t-shirts can be worn on Spirit Fridays. Super Bowl Raffle Basket tickets are also for sale. Look for the info that came home in your child’s homework folder this week. You can pick up additional tickets in the front office, and next week I’ll post an electronic version for printing as many as you’d like. Anyone can purchase a ticket, so share the fun with friends & family! The ICS PTA has many fun family events coming up in January & February. See below for complete details about their annual potluck at ICS and the Bowl & Brew in Manayunk. The 4th Annual Bowl & Brew is scheduled for Saturday, February 25, 2017 (<– note the new date!) from 3:00 to 5:00! 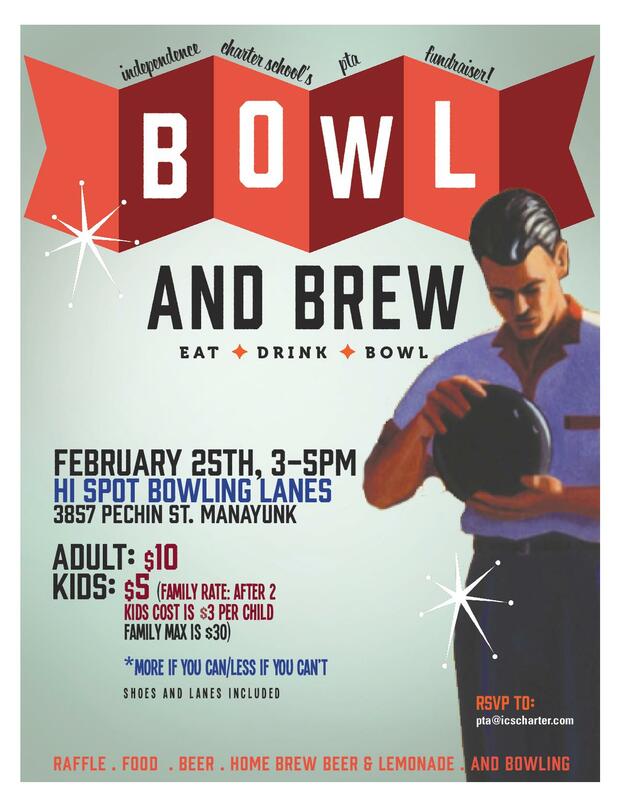 Join the PTA at Hi Spot Lanes at 3857 Pechin St in Manayunk for a fun and friendly fundraiser with good food, home-brewed lemonade and beer, and lots of bowling. Alumni BBQ – The Alumni BBQ is back in 2017 and will be held on Saturday, June 3 from 2-4pm. Event page is here for easy sharing with all those awesome alumni you know and love! If you are a parent of an alum, send me their most current email address and I’ll add it to our alumni community group if they’re not already a member. Support our Green Schools project “Bags for Bags” – which is now live! – by donating your RecycleBank points or signing up for Philly’s Recycling Rewards program now. Recycle your Christmas tree to save it from a landfill – You can drop off your tree anytime at Orianna Hill Park (corner of Poplar and Orianna) through January 15. Donations to Northern Liberties’ parks gratefully accepted: nlna.org or oriannahill.org. Immigrants’ Rights Teach-In – Immigration law professors around the state, led by Shoba Sivaprasad Wadhia at Penn State, have organized a statewide teach-in on immigrants’ rights in the wake of the election today, Thursday, January 12 from 4:30 to 7:30 pm. The event will be held both at Penn State and at the University of Pennsylvania Law School, with speakers and audiences in both locations, and live-streaming between sites. For those of you wishing to participate in Philadelphia, please join us in Room T-145 at Penn Law. Please share information about the event widely: https://pennstatelaw.psu.edu/events/teach-immigration-law-policy-and-rights. A livestream is also available for folks who can’t attend in person. The target audience is community members and organizers, students, academics, local government and university members. A more detailed description of the program as well as an agenda and speaker bios can be found here. Please contact centerforimmigrantsr@pennstatelaw.psu.edu if you have any questions about the event. MLK Day of Service – Stay tuned for an email tomorrow with family-friendly ways to learn & serve together this weekend! If you know your family is participating in a certain event, send me the details tonight and I’ll include them tomorrow.